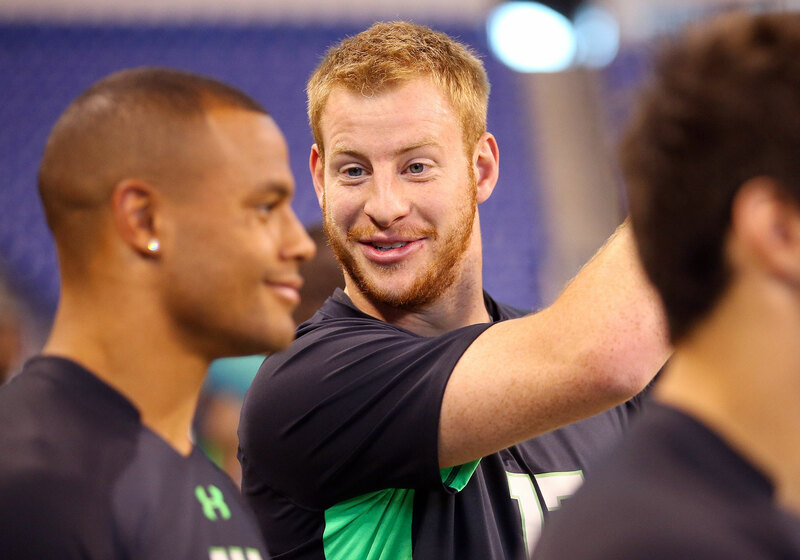 Why were NFL draft pundits so wrong about 2016's rookie quarterbacks? On April 11, quarterback guru Steve Calhoun of the Armed & Dangerous Football Camp was a guest on SI Now. Three days later, the Rams traded up for the 2016 draft’s No. 1 pick, and about two weeks later, the Eagles made a similar move to grab the No. 2 spot. Goff and Wentz, sure. By that point, it had become rather obvious that a QB-needy team would swing a deal with the Titans to nab one of those players. With rebuilding Cleveland set to pick second but active in trade talks itself, the other prospect was not expected to fall far. But Kessler and Prescott? At best, they—like the majority of the 2016 QBs, including Goff and Wentz in some people’s minds—were viewed as long-term developmental projects. If they could be serviceable backups, great. If they ever matured into starting NFL quarterbacks, all the better. The consensus was that they were not ready to be faces of the franchise out of the gate, nor were they drafted to fill those roles. Circumstances changed. By Week 3, Wentz, Prescott and Kessler held their respective team’s QB1 slot; another rookie, Jacoby Brissett, made a spot start that same week for the Patriots. Together that weekend, those four rookies combined for three wins, 873 yards passing, five touchdowns and just one turnover (a Kessler fumble). Even in a year full of surprises from the rookie QB class, up to and including Goff riding the pine for the first two months, Week 3 was a stunner. Almost no one saw it coming. So what did Calhoun notice that so many missed? Indianapolis. February. Carson Wentz takes the podium at the NFL scouting combine, in front of dozens upon dozens of media members. For any draft prospect, these press conferences can be daunting. For a kid from Bismarck, N.D., who played his college ball in the Football Championship Subdivision, who suddenly has the eyes of the entire league on him, it’s a veritable trial by fire. Wentz owns the room. He bounces from question to question like a seasoned White House press secretary, covering topics ranging from the type of offense he ran in college to why he loves the state of North Dakota. It is a performance reminiscent of Derek Carr’s from the 2015 combine—the soon-to-be Raider dazzled with his professionalism, even staying beyond his allotted press-conference time to answer questions about his young son, who had battled health problems early in his life. Believe it or not, those moments matter—quite a bit, in some cases. The combine is overwhelmed by talk of height, weight, speed, hand size and so on, but what happens elsewhere helps paint a significant part of the picture. Everyone, from each of the 32 NFL GMs to any casual fan sitting at home, has access to extensive game tape these days. We all can see if a quarterback has a strong arm or can run outside the pocket. What’s often missing from such study is the so-called intangibles, issues like how a quarterback interacts with his teammates or how he responds to a loss or how he behaves when faced with adversity. There is no surefire equation for evaluating quarterback prospects, because those unquantifiable variables will always exist. That’s one thing for any of us on the media side of the evaluation process, who fire out rankings and mock drafts and try to assess as accurately as possible how impactful each rookie class will be. It’s another thing entirely for NFL front offices, where jobs live and die with draft successes or failures. Nowhere is that pressure more evident than when a franchise has to find a quarterback. Therein lies the explanation for why something as simple as a combine press conference can hold water in the draft process. NFL teams want to see prospects perform well on the field at Lucas Oil Stadium during that week, but front-office personnel will tell you that it’s everything else—the medical checks, the one-on-one interviews, the play diagrams up on a whiteboard—that drive a prospect’s value. Even those elements only take an evaluation so far. Which doesn’t help much when a team cannot see how its draft pick will perform at the NFL level until he is thrown into the fire. There’s a chance the Rams would have benched Case Keenum by now if they had drafted a quicker study, but there’s an equal chance Jeff Fisher would have applied his slow-and-steady approach to quarterback development on whomever Los Angeles had taken with the No. 1 pick. Six rookie QBs have played before Goff in 2016—Wentz gets the nod for elevating Philadelphia’s inferior supporting cast, which would definitely come in handy in L.A.
Prescott is an unlikely Rookie of the Year front-runner, and his mobility, decision-making and ability to protect the ball (seven TDs against just one pick through six games) would make him an immediate fit at the helm of Doug Pederson’s offense if the Sam Bradford trade had also occurred in this alternate timeline. Wentz’s higher long-term ceiling was the only thing keeping Prescott from jumping all the way from pick No. 135 to pick No. 1, and in the wake of Wentz’s sloppy play in Week 7’s win over the Vikings, even that toss-up is no sure thing. Bosa has been excellent in the first three games of his holdout-shortened rookie season, but Ramsey is making an early case to be the best player to come out of the 2016 class. Almost immediately, he has stepped in against No. 1 receivers and held his own—in the past few weeks Amari Cooper and T.Y. Hilton have seen their numbers dip after a day of constant attention from the Jaguars’ top pick. San Diego could use depth in the secondary, and a Ramsey–Jason Verrett duo would be nightmare fuel for offensive coordinators for years to come. Think the Cowboys are good with using a top-five pick on the league's leading rusher through seven weeks? Prescott is already off the board in this do-over draft, but maybe Connor Cook, the mid-round QB Jerry Jones wanted all along, will still be there when Dallas goes looking for a Tony Romo understudy who can be ready at a moment's notice. Conklin has been the most consistent of this year’s rookie tackles, fitting right in on the nasty offensive line that has powered the Titans’ rushing attack to second in the league. The Jaguars’ run game sits 31st in total yards through seven weeks—and their pass-first offense doesn’t explain it away, as they’re managing just 3.7 yards per rush. Jacksonville was incredibly lucky Ramsey fell out of the top four in the first place; in this re-do, Dave Caldwell gets a chance to add some support for his offensive playmakers. The draft’s biggest what-if: Who would have selected Tunsil if video of the consensus top lineman smoking marijuana through a gas mask bong hadn’t hit the internet moments before the draft started? Stanley has endured a frustrating start to his rookie year, missing the past four games with a foot injury, while Tunsil has steadily come into his own at left guard clearing the way for the resurgent Dolphins. Trapped on the Rams sideline at midseason, Goff is still a mystery, but a mystery would represent a significant step up from the known quantities San Francisco has played at quarterback so far this season. Buckner collected his first two sacks in Week 6, but he is also part of the cast of dozens responsible for the 49ers’ abysmal run defense. With the benefit of hindsight, the team who picks Bosa would know how seriously the Ohio State star takes the issue of offset language in the negotiation of his rookie deal. Regardless, 16 games of production at this pace would feel like a steal for Tennessee at No. 8: Bosa has had two multi-sack games in three weeks and never stops working toward the ball. Floyd terrorized the Packers in Week 7 with two sacks and a forced fumble he recovered himself for a touchdown, by far the loudest statement he’s made in a quiet but promising first two months. The 1–6 Bears have plenty of holes to fill, but it’s hard to find a receiver or defensive back that has played well enough to knock Floyd from this spot. With Apple still finding his footing and Janoris Jenkins earning his splashy free-agent deal as a complement to Dominique Rodgers-Cromartie, the Giants may prefer in hindsight to have added a little more athleticism at safety. It wouldn’t be hard to find a space for the smaller, slighter Joseph to play off Landon Collins’s bruising style in the back—Joseph has settled in quickly on an Oakland defense that has demanded plenty of its safeties so far. Hargreaves has been quiet (in a good way) for the Buccaneers, who dropped him right into their starting lineup in Week 1 and kept him there. The numbers may not be there yet, but the early returns on this year’s rookie cornerback class point to few sure things at the position, and Tampa Bay won’t regret snapping up one of them. New Orleans is only just now getting Rankins back from injured reserve after the Louisville product suffered a broken fibula in training camp. Ngakoue doesn’t plug the interior the way Rankins is expected to when healthy, but third-round pick has gotten to the QB with regularity and overshadowed the rest of Jacksonville’s flashy defensive line in the first half. Ngakoue and Terrell Suggs are the only players to collect four sacks and an interception in the first five games of their NFL career. In a world where the Dolphins don’t luck into one of the draft’s top prospects nearly midway through the first round, Whitehair is a perfectly acceptable consolation prize. He may never slide outside to tackle the way Tunsil is eventually expected to, but Jay Ajayi’s breakout has underscored the importance of sound interior line play in Miami, and Whitehair has helped stabilize that chronic problem area for the Bears, moving from guard to center admirably when preseason injuries forced some shuffling of the line in Chicago. Neal has been all over the field for the Falcons, with two forced fumbles and a pair of passes defended after missing the first two weeks of the season with a knee injury. If the Raiders can’t have their first-choice safety Joseph, defensive coordinator Ken Norton Jr. would have no problem making use of the weapon Dan Quinn (Norton’s former colleague on the Seattle defensive staff) has deployed as Atlanta’s Kam Chancellor. Coleman was off to a promising start through two weeks before suffering a broken hand in practice that has sidelined him ever since. Will Fuller was just as electric out of the gate for Houston, and although he’s coming out of a dreadful three-week stretch (a combined five catches for 26 yards against two of the league’s best defenses in Minnesota and Denver, plus a hamstring injury that forced him to miss Week 6), no first-year receiver has shown off a higher ceiling. Even before the Lions lost top corner Darius Slay to a hamstring injury in Week 7, their defense was thin on the perimeter. Apple has had an equal share of solid plays and rookie learning experiences within New York’s improved defense. Sitting 28th in the league with 8.2 yards allowed per pass attempt through seven weeks, Detroit could live with a few teachable moments. With their first round pick off the board, the Falcons grab their second-round pick ahead of a long line of teams in the back half of the first round who need help at linebacker. Jones’s exceptional athleticism has translated to the pros seamlessly, and he got to put it on display in taking the first of his two interceptions this season 90 yards to the house in New Orleans. He seems to make Atlanta’s entire defense faster. Brown’s unassuming size (5’ 11”, 212 pounds) and unassuming school (Akron) knocked him down to the fifth round, but he has made evaluators look foolish with an explosive start after stepping in for Manti Te’o in San Diego. The speed that helps Brown fly to the ball and the ball-hawking skills that he uses to make something happen once he arrives—he has three sacks and two forced fumbles so far—would bring a little stability to Indianapolis’s disintegrating defense. The Bills are only just now easing Lawson into the defensive rotation after the Clemson product spent the first six weeks of the season on the physically unable to perform list. They have gotten surprising results at linebacker from NFL sack leader Lorenzo Alexander and team-leading tackler Zach Brown, but Rex Ryan has to have his eye on the speedy rookie that slotted right into the linebacker corps of Ryan’s prior employer. Next to his college teammate Leonard Floyd, Jenkins was seen as a more traditional, lower-ceiling linebacker prospect without the eye-popping athleticism that draws first-round attention. After missing two games with a calf injury, Jenkins cracked the Jets’ rotation and provided some reliability in run support they’ll sign back up for now that Lee has been stolen by a division rival. The knowledge that J.J. Watt would be lost for the year after summer back surgery would probably have pulled the Texans away from their playmaker-heavy draft strategy in search of more immediate help in the trenches. Buckner and Jadeveon Clowney would make for an intimidating (if still somewhat raw) pair of rushers coming off opposite edges. Achilles issues have scuttled Doctson’s rookie year, and the list of healthy, dependable first-year wideouts to replace him in this do-over thins out quicker than anyone could have expected it would this spring. It may be best for Washington to turn its attention to the secondary, where nearly everyone has been banged up at one point or another. The Steelers’ first-round pick, Burns is tied for the team lead with four passes defended and has been taking on more responsibility week by week. The Vikings have the NFL’s best record and its worst rushing attack, while Henry is the picture of Tennessee’s embarrassment of riches in the running game. He has gotten limited work behind DeMarco Murray, but he would represent a giant upgrade over the Jerick McKinnon-Matt Asiata duo that has combined to average just 3.2 yards per carry. Treadwell is just the latest rookie to go missing in the slow-and-steady developmental approach favored by coach Mike Zimmer—at running back, the Vikings can’t be so picky. Even if the Colts had passed on Kelly in April, someone would have taken the 2016 draft’s best center prospect in the first round. Based on the early returns in Indianapolis, he could have pushed Russell Bodine for starting duties in Cincinnati right out of the gate. Cravens got off to a solid start in Washington, coming up with the clinching interception in the Redskins’ first win of the season over the Giants, and last weekend he returned from a concussion that cost him two weeks. He has been the versatile back-seven threat he was advertised as coming out of college, and the Steelers wouldn’t have grabbed defensive backs with their first two picks of 2016 if they thought their incumbent secondary was all set with playmakers. Would Kessler have stood out in Denver’s crowded QB race the way he turned heads in Cleveland? 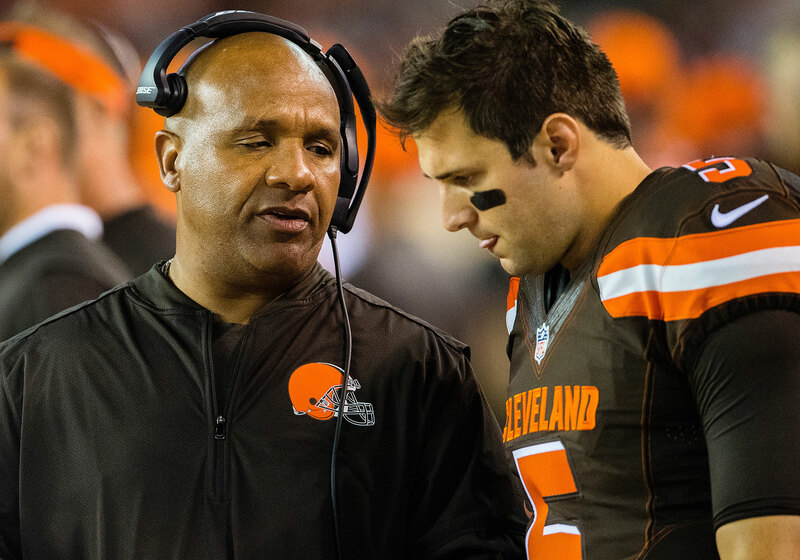 He has silenced Draft Twitter’s snark in piloting a surprisingly fun Browns offense after injuries to Robert Griffin III and Josh McCown handed him the starting job, and if Kessler stays upright himself down the stretch, he’ll give whichever QB Cleveland drafts in 2017 all the rookie can handle in camp. Gary Kubiak has crafted his offense to accommodate much lesser talents at various points over the past two years. Jody Nelson’s return hasn’t fixed the Packers’ offense the way many hoped it would, and even if it had Aaron Rodgers wouldn’t say no to another receiver who can get open downfield. Thomas, the latest beneficiary of the high-flying Saints offense, leads all rookie wideouts with 437 yards. If he can earn Drew Brees’s trust so quickly, he can earn Rodgers’s. San Francisco is even more barren at receiver than it is at quarterback, so what better place to slot in the draft’s most polished product at that position? Shepard has run hot and cold with the Giants’ unpredictable offense, but he could easily one-up the surprising success Jeremy Kerley has found sucking up targets from 49ers passers this year. Nkemdiche has been a non-factor in the first half, buried within a loaded front seven. Instead of pouring resources into another reclamation project, the Cardinals might be wishing they’d addressed their unexpectedly streaky passing attack, which has suffered from injuries and inconsistency so far. Adding a big-play tight end (Henry was far and away the best in the class and has shined of late in San Diego) might round out Carson Palmer’s options nicely and get the rest of the offense rolling up to all-purpose back David Johnson’s All-Pro pace. Sure, the Panthers whiffed by slow-playing their search for Josh Norman’s replacement. But as mentioned above, there just haven’t been that many impressive rookie corners in the early going this fall. Fuller has acquitted himself well after stepping in as the Redskins’ nickel corner—would he beat out fellow rookies Daryl Worley and James Bradberry for the No. 1 corner job in Carolina? While we’re here in the land of counterfactuals, it might be worth a roll of the dice. Ifedi’s first two months as a pro have been marked by injury and inconsistency, while Thuney, a third-round pick (No. 78) by the Patriots, has earned rave reviews. He could have provided an upgrade at any number of positions in Seattle, where no one is safe on the much-maligned O-line. Eric Galko is the founder of Optimum Scouting and the scouting director for the Dream Bowl, a postseason college all-star game. As he drives to his next information-gathering pit stop, though, he is thinking like an NFL general manager. The Rams traded two first-round picks (2016 and ’17) plus a handful of other second- and third-rounders to Tennessee for the chance to draft Goff. The Eagles’ package for the No. 2 pick opened with their 2016 and ’17 first-round picks (they later reacquired one of the latter by dealing Sam Bradford). The Texans handed Brock Osweiler $18 million per year, the Redskins slapped a franchise tag worth nearly $20 million on Kirk Cousins. And then the Browns and Cowboys quietly found potential long-term starting QBs in the third and fourth round of the draft. Part of the rub here, of course, is that neither Prescott nor Kessler nor, in truth, any of the 2016 QBs were drafted to start right away. There is an alternate timeline where Teddy Bridgewater, Tony Romo, Jimmy Garoppolo, Trevor Siemian and either Robert Griffin III or Josh McCown stay healthy, and the rookies haven’t seen the field save for the preseason and the occasional mop-up duty. That a small handful of first-year quarterbacks have been able to step in and hold their own points to another meaningful disconnect: The media breaks down talent in the grand scheme of the entire league; each individual front office looks only at how Player X fits its system. We had the same level of disagreement here at SI when setting our draft board. I lobbied for Goff as the top QB, while Doug Farrar, now at Bleacher Report, sat on Team Wentz. In the end, Goff landed at spot No. 14 on our Big Board, Wentz at 34. Farrar then gave the Eagles an “A” grade for their Wentz selection and the Rams a “B-” for taking Goff. Does that mean Doug was right and I was wrong? So far, yes. Long-term ... maybe. We don’t know yet whether Goff is any good, nor for how long Wentz, Prescott and Kessler can maintain any positives they’ve thus far displayed. So much of the early returns have come because of the very specific situations in which those quarterbacks landed. What if the Rams had taken Wentz instead? Would the Eagles still have felt compelled to trade away Sam Bradford, thus clearing the way for Goff to take over? Or how about if the Cowboys had nabbed, say, Connor Cook in the third round instead of using a fourth-round compensatory pick on Prescott? Would we now be talking about Cook the way we’re talking about Prescott, or would the Cowboys have a journeyman veteran holding down the fort until Romo returns? The NFL is a copycat league, so there no doubt will be efforts to replicate this draft class’s victories—the hunt for another FCS high-riser like Wentz or a proven college star like Prescott. There’s never going to be a straight point-to-point comparison. It depends on the player. It depends on the situation. It all has to come together just so for there to be any positive outcomes on the field. The three quarterbacks often mentioned at the top of the 2017 draft class are Notre Dame’s DeShone Kizer, Clemson’s Deshaun Watson and Miami’s Brad Kaaya. The prospect who has undergone the biggest rise since the season’s start, however, is North Carolina’s Mitch Trubisky. Pro Football Focus recently named Trubisky one of college football’s four “breakout” draft prospects this season. CBSSports.com analyst Dane Brugler, who each year produces one of the most comprehensive draft guides available, just handed Trubisky to Chicago at No. 4 in a 2017 mock draft. Trubisky has started eight games in his North Carolina career. Is that enough of a sample size for NFL teams to start formulating an opinion of him? Will they feel better by season’s end when, if he stays healthy, Trubisky likely will have 13 starts under his belt? But the flip side is that those first-round traits might get him drafted in ... well, the first round—if he chooses to bypass his final year at North Carolina to test the NFL waters. Trubisky is arguably the prime example right now of how the 2016 class could spin the NFL forward. No matter how he performs down the stretch for the Tar Heels, his game experience will be limited coming out of the season, and odds are any mechanical worries will still be there. Still, teams eyeing quarterbacks will wonder what he might be capable of in the right system, with a summer’s worth of pro coaching. When the raw talent is evident like it is with a player like Trubisky, can the NFL solve the rest of the formula? “So then we were hanging out with Cody, and a couple of teammates are standing maybe 100 yards away across campus. They started yelling over, ‘Hey, Cody!’ Then they ran over just to say hi to him. Calhoun has the advantage of working up close with many of the game’s future stars at quarterback. Kessler trained with him starting at the age of 12. He sees others, like Prescott, at the prestigious Manning Passing Academy. NFL teams spend an abundance of resources on scouting at the college level, from area scouts up through their general managers. They do not really get any extended one-on-one time with prospects until after the college season ends—the Senior Bowl, the combine, formal visits before the draft. So, the hunt for those coveted positive intangibles is limited in many ways to a two-month window from February through April. The challenge is even steeper when it comes to uncovering a player like Wentz, whose college games were not available across the country live on ESPN or CBS each week. The process will not be markedly different moving forward. Teams and draft analysts have been in their 2017 books since almost the moment the 2016 draft ended. The road still has all the signature stops: the start of the college season, bowl games, all-star games, combine, private workouts. The question is what, if anything, can be gleaned from how relatively smooth the transitions for Wentz, Kessler and Prescott have been. There is no satisfying solution here, no degree of certainty with which the 49ers or Browns or Bears could draft a quarterback near the top of the 2017 draft and know, beyond any doubt, that he is going to be great. Calhoun had a hunch about Kessler and Prescott for reasons that went beyond what could be measured easily. A reminder, too, that he mentioned Goff as a QB that could start early. Just because that assertion has yet to pan out does not make his guesses about the other rookies any less correct. Each individual case is a snowflake. As we’ve seen this season, those circumstances can change in a heartbeat.